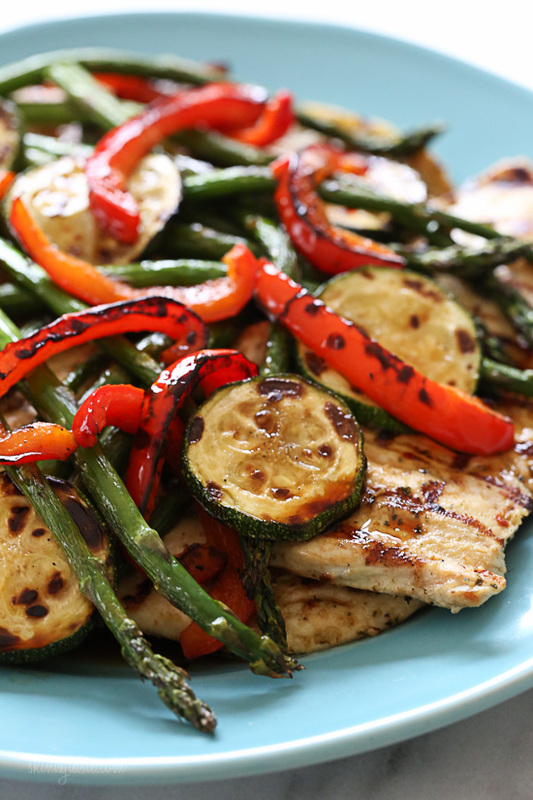 Grilled chicken breast, zucchini, red peppers and asparagus topped with a honey balsamic dressing – this is SO good, I know you’ll be making this all summer and nothing beats an easy summer dish made entirely on the grill so you don’t have to heat up your kitchen! 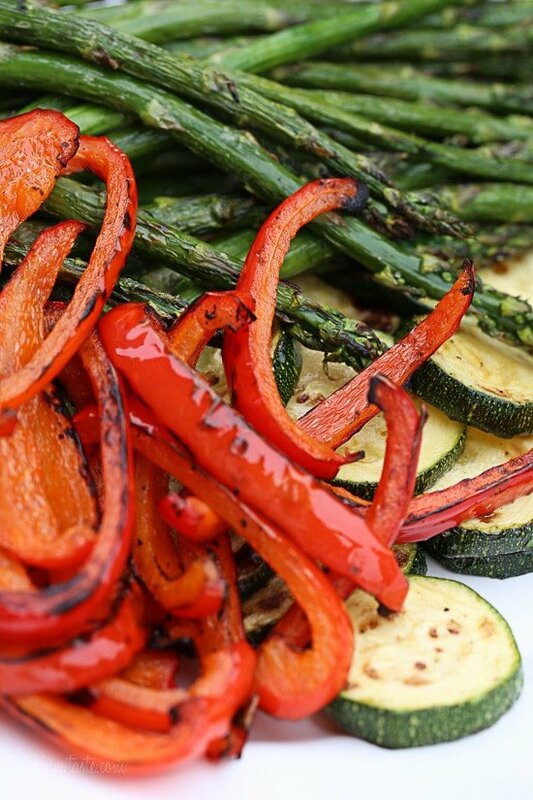 I love cooking my vegetables on the grill in the summer. It doesn’t take very long and the vegetables taste incredible when edges get all charred. 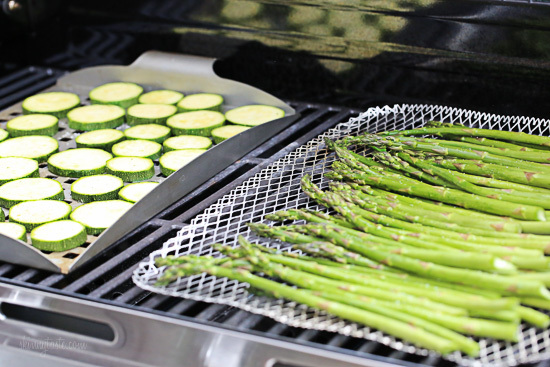 The best way to do this is to purchase a grill pan (or two) or vegetable basket so the vegetables don’t fall through the grates and just spritz the vegetables with a little olive oil and season with salt and pepper. They also sell disposable ones in the supermarket which also work fine. I do most of the grilling myself when I’m home alone on my gas grill. It’s really simple to do, so don’t be intimated. Get to know your grill, mine cooks hotter towards the back so I keep that in mind when I’m grilling and move things around accordingly. This was sooo good!! Going into our rotation. I grilled the chicken but roasted the veggies in the oven and it still was delicious. Do you marinate veggies too? I expected this to be good, but it exceeded my expectations. My husband loved it too. Making it again this week! So simple and seriously tastes like something from a restauarant. I was pleasantly surprised – this will be another one added to the regular rotation! Delicious marriage of flavors! We grilled this recipe tonight after I showed my husband this recipe. It was so delicious and will definitely be a big part of our summer grilling menu. This is 5*s in our book. It’s not fancy but my husband and I would have eaten the entire recipe if we hadn’t exerted some self-control. Normally, my husband needs chicken slathered in a sauce but he loved this. We both enjoy our vegetables and the grill did a great job in bringing out their flavor. And he is not a man who loves to grill.This couldn’t be much easier. and might even be okay for company. Simple, fresh and healthy. Loved it! chicken left overnight was fantastic. We also added broccoli and they actually tasted the best out of other veggies we also cooked it with zuccihini, red bell peppers, etc. We both liked the bit of a charred taste it had and felt as though it soaked up all the sauce haha. Started making this last summer. Finally nice enough weather today to make again this Spring. So simple and flavorful. Family delighted to know it’s back in the rotation!! I don’t normally post on these things but wanted to tell you that I have made quite a few of your recipes and haven’t had a bad one yet!! I made the honey balsamic chicken tonight and it was yummy!!! My husband even liked it and he isn’t a chicken fan. Thank You!!! I love your Instagram stories too!! ? This is a great recipe. Had the time to marinate it overnight and it was so good! Only a family of 2, so made half recipe and had a bonus lunch leftover. I’ve made this many times with lots of different veggies and it’s always amazing. I can’t remember if she uses breasts or thighs but the BBQ’d thigh meat is soooo good! This website was a total jackpot find! This was so good! I did not have time to marinate and used a tube of basil found at the grocery store and it was just as good. My husband doesn’t like veggies usually and he went back for seconds and thirds! The balsamic dressing poured over at the end is delicious! Made this last night. So yummy — grilled chicken was perfect. I roasted veggies in the oven. Thanks for your great recipes — I use them all the time! Delicious! My husband won’t eat pesto so I mixed the dressing ingredients with the lime and crushes red pepper. Turned out so yummy! Thank you for this great site. Wonderful recipe. The only change is I used 2 full 12 oz boneless breasts with your ‘skinny pesto’, because that is what I had on hand. I just cooked it longer using an instant read thermometer to make sure it did not get over or under done (165 degrees). I then cut the breast into slices on an angle. The flavors were great, marinating for only 6 hours. One other tip on the veggies, get the sweetest red pepper you can find. It really makes a difference in the combination of all the flavors. Made this tonight and it was delicious!!! Everyone cleaned their plates. Marinated the chicken for over 24 hours and it was very flavorful. Definitely would make this again. This recipe is not only delicious, it’s healthy and super easy to make. There’s a lot of flavor with the chicken marinade as well as with the balsamic vinegar, honey mixture. This is a keeper! I’m sorry you’ve sold out to the almighty dollar. Pushing products for financial profit took you off of my list of heroes. Thanks for the help you gave me when I lost 75# last year but I’m no longer a fan. Very disappointed. These recipes and service cost you nothing, but my time and work are not free. Sorry to see you go! Doubt any child under 12 months would be eating this but they might be fed raw honey. Raw honey should not be consumed by children under 12 months of age. Google it if you want. As someone who LOVES to cook but woke up today in that mood where I just didn’t have any ideas or motivation – waking up to see this post, AND having all of it on hand is a WIN! Making the marinade now, have a great weekend! Ok, I may be a little behind times, but what is the actual purpose of the grill pan other than to leave the grill marks? This is the best chicken recipe I have ever made. Only thing I did different was use lemon instead of lime (not a fan of lime). I will be adding this in to my meals monthly!!! Can you marinate the chicken in the hiney and balsamic instead of basting it? Is the serving size of 3 ounces of chicken raw or cooked? thank you! Made this tonight. Me and the hubby loved it. The electric grills are great! My sister has one and uses it in her kitchen all the time. Love the George Forman grill also. BTW cant wait to try this and so many other recipes here. LOVE, LOVE, LOVE, this site! I love this recipe! I used my George Forman grill for the bell peppers and chicken. Then, used my grill pan on the stove for the rest of the veggies. It turned out great! I don’t like pesto. What could I substitute in its place or could I just omit it? What would that do to the points? Serving size: Is the 3 oz serving for 3 oz of chicken or 3 oz of chicken and veggies COMBINED? I’m on Weight Watchers and I want to be accurate with my servings. Thanks! This is delicious! I have made it 3 times in 2 weeks. Thank you for time to share these wonderful recipes. 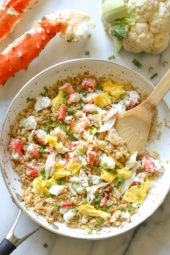 Do you think this would work mixed with pasta as a pasta salad for a bbq? This was so good! I made it in the oven, and baked it for about 20-25 minutes on 415 degrees. A must try, so good and light! This recipe is ridiculously good! The hubby and I have made it several times already and love how versatile it is. I just use whatever veggies I have on hand. We made it the other night but it was raining so we diced up the chicken, cooked it on the stove and roasted the veggies in the oven. Fantastic! Thanks for another amazing recipe, Gina! Perfection! Loved it!! Only mad I waited so long this summer to try it! Okay – I'm not going to lie, the pesto/lime juice combo weirded me out a little. But as you have very rarely steered me wrong, I went ahead and did it. I don't like zucchini and my husband doesn't like asparagus, so I subbed Yukon gold potatoes, cut into bite-sized pieces and boiled for 15 minutes before mixing with 2 sliced bell peppers – a yellow one and an orange one. I would have subbed green beans for the asparagus, but the beans at my supermarket looked kind of sad. Next time I will. And yes, there will be plenty of next times! This was so good! The vegetables got a great smoky char on the disposable grill pan I used and the chicken was to die for. There's only two of us and I made the whole recipe, so we both have lunch today and two leftover chicken breasts that I'm going to serve over whole wheat pasta tonight. Definitely a keeper! I do not have an outdoor grill so I was wondering if a George Forman grill would work the same? Would rotisserie chicken work? Also, I've seen the pesto in the markets to be very fattening; not sure if it's good fat, or not, but I want to put on my yellow 'advance with caution' lights:) I have the rotisserie chicken on hand and like the texture of that. Rotisserie chicken would not work. It's already cooked, so marinating it would be pointless and putting it on the grill to cook even further would give it the texture of an old shoe. As for pesto, it's full of olive oil and pine nuts – of course it's high in fat! Great recipe, we all enjoyed it – even the 7 year old! Easy to make, no changes needed in the recipe. I love this site – many choices, and always new additions. I recommend it to everyone. Hi Gina……..Can you tell me where you purchased the grill pan you use for the asparagus? Thanks…..this recipe is AWESOME!!! I don't normally post comments about recipes, even if they are amazing and become keepers but this recipe is INCREDIBLE! I made it for the first time tonight and I am currently eating my second helping while I type this comment! I followed the recipe step by step and it was amazing! Thank you for this awesome recipe!! Thanks for leaving a comment, so glad you enjoyed it! This was wonderful! I made it all with a grill pan on the stove and it turned out great. Can't wait for the leftovers tomorrow! What do you do with the balsamic vinegar component? Drizzle over everything when it's done. Thank you!!! 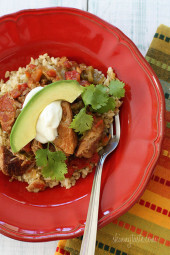 Soooooo yummy, flavorful and easy! I can't tell what goes in the dressing. Is it everything that hasn't been used up to that point? This looks like a perfect 4th of July bbq option or any night of the week! Yum!!! Yes, Gina, I'm also interested in that wire mesh grill pan. Where did you get it? I've been on Amamzon and Bed Bath &Beyond and can't find it. Veggies are ready to go! Hey Gina, can you share links to your grill pans? I'm looking for inexpensive ones because I only have a grill temporarily. Foil doesn't quite have the same flavor (and is more wasteful). You could just get a cast iron grill pan. I have one that works perfectly. Once it was seasoned, there is no stick and food turns out great! I believe Walmart, Kmart, Sears all carry those, also Cracker Barrel. I also have a Le Creuset, I got it at the outlet center and on sale! I am obsessed with your recipes – I am making my way through the cookbook that I got for Christmas. My favorite is the fish tacos with avocado cream sauce! I just made this honey balsamic chicken recipe for a new mom. It looks so good! Sub for the balsamic vinegar?! we have made this THREE times in the past week! thank you for your wonderful recipes! Wonderful, thrilled you like it!! I made this last night – it rained so I had to make it inside. I broiled the vegetables and seared the chicken in a pan and it turned out delicious! I love the combination of pesto and balsamic. I will be doing this one again! I made this for dinner tonight and we loved it. My rule of thumb is to always make a recipe the exact way it is written when I am making it for the first time. I do this so the next time (If it's good enough to make a next time) I can change it if I want less of this or more of that. This recipe requires no changes as far as I am concerned, it's excellent just the way it is! An indoor grill pan works great too, or you can just saute everything in a skillet. Gina, this was wonderful. Unfortunately, we live in Yuma, AZ. It was 110 today and my husband thought it might be a better idea to heat up the kitchen. LOL. We both enjoy your wonderful recipes and I love your cookbook. Back to tonights dinner…The flavor was outstanding. Next time I think I will add mushrooms and cut the zucchini just a little thicker. I know we will enjoy the chicken and veggies in various dishes. Thanks once again. I am totally amazed with the beautiful flavors that you are able to combine. I also have no grill, and no room for one on my tiny apt. deck. I'm thinking this might be done in a grill pan on the stove top, no? Maybe with the vegetable and chicken amounts halved so I wouldn't have to do it in too many batches? I love my grill pan, yes! 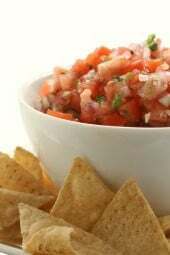 Just do it in batches and you can easily halve this recipe. Check out some of the smaller grills from Lowes. They even have a really small electric one if you don't like using charcoal/propane. Not an employee of Lowes, just a guy. This looks delicious. Do you think I could get the same result on a george foreman gril? This does look so delicious and good-for-you! I have decided that as soon as we are home from vacation, we are changing our eating habits…this will be one of the first meals I'll prepare. Thanks and keep those recipes coming for my days of meal-planning ahead! Wonderful dish to start a healthy habit! Can't wait to try this! 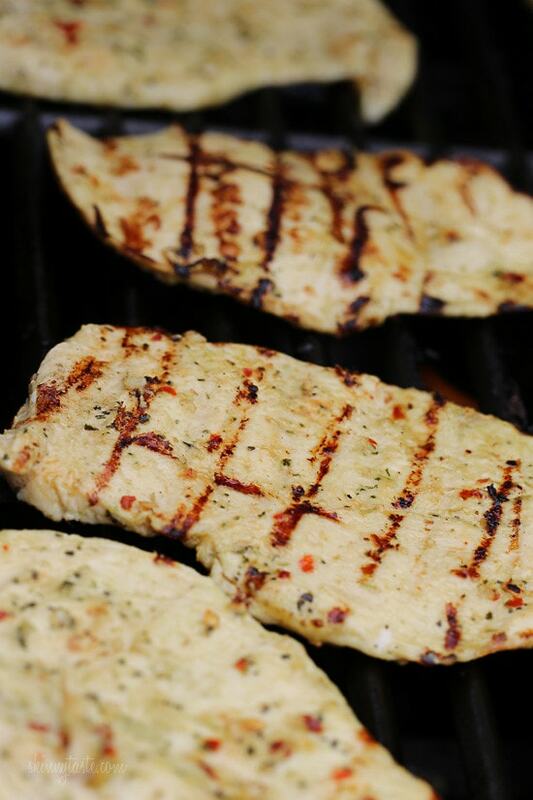 Looks easy and delicious and I'm always looking for easy recipes to grill. Thanks Gina! Raw honey is typically a local honey "fresh from bees" that is unprocessed and not heated. You may find it in natural food sections/stores. I have used regular honey in a lot of recipes, so it's a substitute if local or raw honey is not available. Raw honey can actually be dangerous for people with suppressed or compromised immune systems and infants, so be aware that while the heating process does take some of the healthful natural things present in the honey out, it is also killing off any unsafe toxins that are naturally present. Botulinum toxin can be in raw honey and can make infants or those with weakened immune systems very sick and even result in death. Please learn what is safe for you and your family. Thank you for the great, healthier recipes, Gina! Sure, any honey would work! Any suggestion on how to do this in oven or broiler? I don't have a grill but this looks so good! I would do it on a grill pan or even a skillet. I USUALLY MAKE THIS WITH ZUCCHINI,YELLOW SQUASH,RED ONION,GREEN, RED,ORANGE &YELLOW PEPPERS AND IF I WANT LIGHTLY BOILED RED POTATOES WITH A HOMEMADE ITALIAN STYLE MARINADE, DRESSING AND MY IDEA OF SEASONING.. FOR THE CHICKEN YOU CAN EITHER, FRY IN SMALL AMOUNT OF OIL IN AN IRON SKILLET WITH RAISED LINES IN BOTTOM TO GET MARKS,PARTLY BAKE TO FINISH IN BROIL OR JUST FRY. HOPE THIS GIVES IDEA, ENJOY. You can get a grill pan (a skillet with ridges and is usually very heavy or made out of cast iron) for the top of you stove to do the chicken and then roast the veggies in the oven on a cooking tray with sides. Can use the grill pan for steaks, too. I use my cast iron grill plan. You can get them cheapest at homegooods for under $20. It works beautifully on the stove or outside. Makes food taste like you cooked it directly on a grill. I couldn’t find my grill basket so I roasted the veggies in the over @400 for about 10-15 minutes and used a grill pan on the stove. Came out great! I did it on grill pan in broiler. Can’t believe I bought, then forgot to use, the asparagus. Anyway, it was FANTASTIC. Really good. Will be making this again. I'm determined to master my grill this summer! Thanks for the tips and amazing looking recipe!